A paste wax that will stand up to the rigors of every day driving! 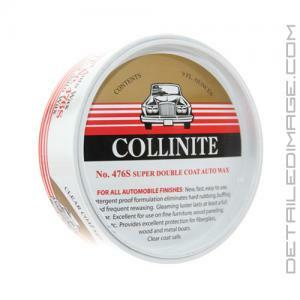 Collinite Super Doublecoat Paste Wax No. 476 is a paste wax that stand up to anything the world throws at it! Can a paste wax give you sealant like protection? Yes it can and you will get up to 6 months of protection from this amazing wax! Just like another popular Collinite product, Insulator Wax No. 845, it can be used on exterior gel coat, fiberglass, clear coat, single stage paints, lacquer paints, highly finished wood, clean painted or unpainted metals; chrome, stainless steel, aluminum, copper, and brass. Just avoid rubber, black trim, vinyl, glass or non-painted plastic. The ease of use of this product will truly amaze you. Just apply No. 476 nice and thin to the surface with an applicator pad by hand. Apply one section at a time and when it starts to dry and haze, buff it off with your favorite microfiber towel. The paint will really pop and shine in the sun giving you the gloss we all love. It will protect your car from rain, salt, pollution, bugs, UV rays, road grime, and other contaminants. If you live anywhere where harsh winter conditions take effect then this wax is exactly what you are looking for. Just like all of the Collinite products No. 476 is hand poured and hand crafted in the good old USA! If you are looking for a paste wax that will protect your car like a sealant then the Collinite Super Doublecoat Paste Wax No. 476 is for you! FOR ALL AUTOMOBILE FINISHES: New, fast, easy to use, detergent proof formulation eliminates hard rubbing, buffing and frequent rewaxing. Gleaming luster lasts at least a full year. Excellent for use on fine furniture, wood paneling, etc. Provides excellent protection for fiberglass, wood and metal boats. Clear coat safe. Apply wax with a clean, soft damp cloth or sponge to a section at a time, and let dry to a haze. Polish lightly with another clean, dry, soft cloth to produce a brilliant luster. The Collinite 476s Double Coat. It stands up to its name on the can, even though its a little harder to rub off. Hint (make sure that its completely dry before wiping off) It seems to bead up more when wet which to me means better protection and that it will last longer. Do a smaller area at a time so it will be easier. It stands up to the salt air here in Jersey and that says something.. The finish results will be worth the little extra time you put in. Believe me!!!! I use for winter wax in the Northeast US, not that hard to apply and remove if you follow the directions. Lasts a long time and looks great, will continue to use as my winter wax and areas that I don't want to wax regularly like rims, door jams etc..
BEST product I have ever used!Only wax I have used the lady 25+ years.